International artists she has performed with include, Il Divo, Don Felder from the Eagles, Nigel Kennedy, Alan Tam (Hong Kong canto pop star), Dianne Warwick, Cliff Richard, Kenny G, The Neil Diamond Tribute Show, Rod Stewart and Jerry Lewis. She has personally played for megastars Richard Branson and Madeline Albright to name a few. In 2005, Suzie G founded the internationally acclaimed electric string trio ‘Maske’. Over the past 14 years Maske has travelled to every corner of the globe entertaining audiences with their high energy explosive show. 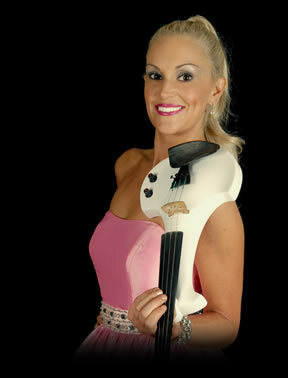 Suzie G is the first violinist and music producer for the group. As well as being the headlining act they have performed with and supported some of the big names in the music industry including country singer Keith Urban, Britain’s Got Talent winner Paul Potts, Turkey’s number one pop star Emre Aydin, and the famous brothers Amaan and Ayaan Ali Khan from India. In 2010, Suzie added another string to her bow moving into the Guest Headline Entertainer luxury cruise ship market. She has cruised with Holland America, Royal Caribbean, Princess, Celebrity and RSSC. Suzie regularly performs all around the world her full length concerts with a seven to ten live piece band. Click here to learn more about Suzie G’s show. On the corporate scene clients such as Audi, Porsche, Mercedes, BMW, Toyota, Fiat, Volvo, Land Rover, Chevrolet, Qantas, IBM, Delta Airlines, Coca Cola, McDonalds, Mumm Champagne, Samsung, Westfield, Taj Hotels, Le Meriden Hotels, Intel, Toshiba, Australian Tourism, Peroni, Hello Magazine, Sony, Yamaha, Optus, and are singing her praises and spreading the word about Suzie G’s total commitment to making any event the best she can.